Politicana | UK & US Politics: Johnson for Prime Minister? .. Alan, not Boris that is. 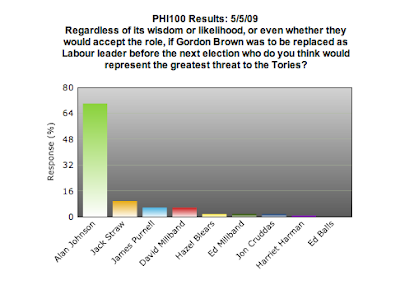 Interesting poll over at Politics Home today stating that the Secretary of State, Alan Johnson is now the overwhelmingly preferred choice to take over should Gordon Brown stand down or be forced out. date, in the experts’ view. Jack Straw was his nearest rival, with a relatively low ten per cent. David Miliband and James Purnell trailed behind with six per cent each. Harriet Harman fared even worse, with just one per cent of the panel believing she would be the best choice for Labour. Johnson gained backing across the political spectrum." As the article on Politics Home points out, there has been a huge collapse in the level of support for Foreign Secretary David Miliband since his peak last Autumn.